Meet the Blok™ 4 IP, the ultimate IP65 rated outdoor fixture in Blizzard’s Blok™ LED fixture series with 2x manually tiltable heads and 4x 25W RGBAW 5-in-1 COB LEDs. 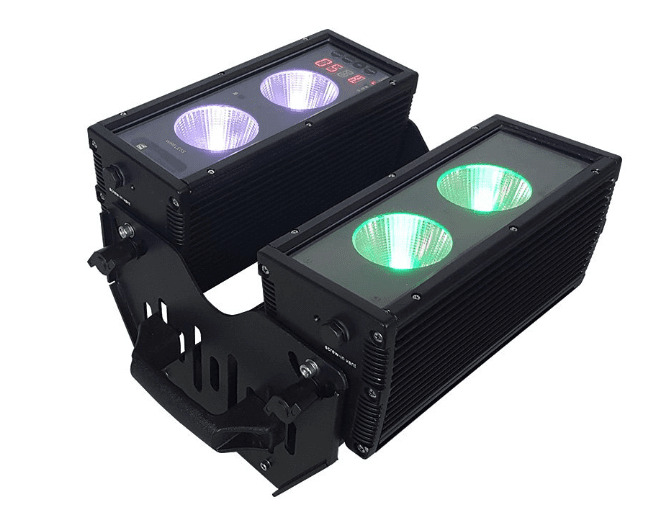 Each of its 70° tiltable heads are fitted with 2x high-output 25W 5-in-1 LEDs that can run in sync with each other or be controlled independently. Blok™ 4 IP fixtures provide excellent color mixing and perfectly smooth dimming with multiple 32-bit dimming curve options, too. Blok™ 4 IP fixtures are equipped with a long-life built-in rechargeable Li-ion battery that can easily run 10+ hours on a single charge, plus, it has a built-in AnyFi™ wireless DMX receiver which can flawlessly support both Skywire™ and W-DMX™ wireless DMX signal types. The fixture has no fans due to its solidly constructed cast aluminum housing with heat sink that naturally dissipates any heat. It also has a tempered glass lens and watertight internal gaskets, which protect the light source, antenna, status LEDs, and the easy-to-use Micro OLED control panel with 4 touch sensitive electronic buttons.